Every year, the Community Association Law Seminar presents a review of significant appellate cases that shaped community association law in the prior year. These cases focus on upcoming, emerging trends in association jurisprudence that are sure to advance the future of the legal landscape of community associations. CAI’s outstanding case law update team reviewed 450 relevant cases from the past year, summarized 250, and formally presented 80 to the 564 attendees of the 2019 Law Seminar. Many trends in litigation coincide with the trends our industry sees in legislation each year. Last year, trends in litigation included amendments, assessments, association operations, association powers, foreclosure, fair housing, Fair Debt Collections Practices Act, bankruptcy, insurance, leasing, covenant enforcement/architectural integrity, civil procedure, declarant control/construction defects, evidence, attorneys fees, and premises liability. 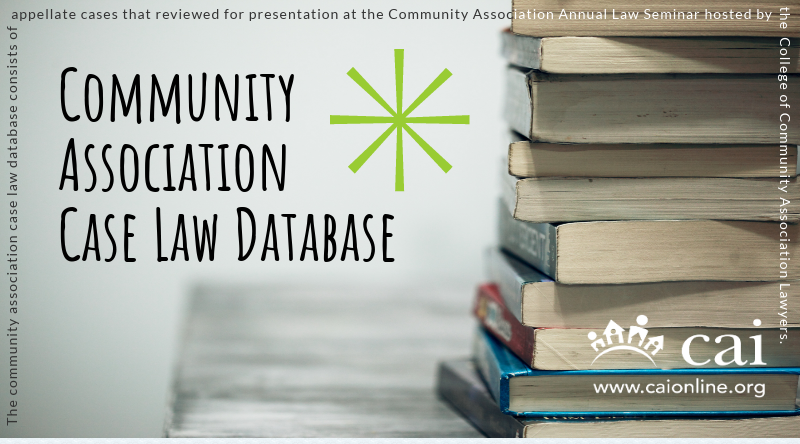 CAI’s case law database is an indispensable resource to community association lawyers across the nation. Whether your practice focuses on community association litigation, regulation, or legislation, please keep CAI’s database in mind as a resource. CAI thanks the case law update team and presenters for volunteering their time and expertise in researching, organizing, and summarizing the important cases of 2018.